Enter the title and the text. 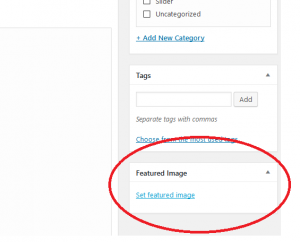 Click on “Set featured image” button (on the right side) to select the immage you want to include on the front page, with the post. 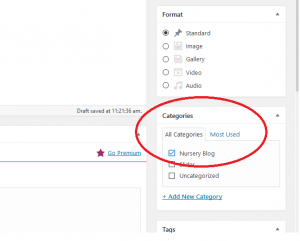 On the right side of the page, select the Category (for the blog is “NURSERY BLOG“), and then you can push the “Publish” button. 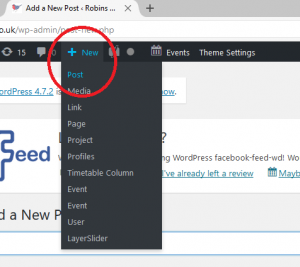 All the posts in the “Nursery Blog” category will be appear on the blog front page, please check carefully the Categories on your posts. to launch the media uploader interface. Click on Upload Document button to select your file/document. Upload Files: Upload the document you want to use from your computer by dragging it into the upload area or selecting from your computer. 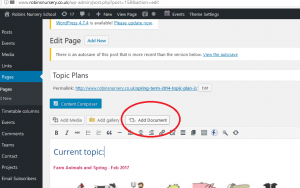 Media Library: Select from any previously uploaded document in the media library by clicking on the one you wish to add to your page or post. Once you have determined your Advanced Options settings, click on the Insert button and your Document will be added into the page or post.